Home › Basketball Plays › Isolation "2"
Basketball Play - Isolation "2"
The defense is in man-to-man. Let's suppose your O2 wing player is your best scorer and offensive threat. You want O2 to get the ball, and have a chance to beat the defender one on one. Run this simple isolation play. Essentially, you have three of your players move off to the left side of the court, resulting in a "clear-out" for O2 on the right side. Now you have several options. Diagram A. The point guard (O1) passes to O2, who can then shoot the 3-pointer, or execute a drive move to the hoop (see Guard Moves and Skills). Diagram B. 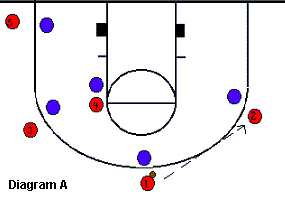 Another option is to have O2 make a jam-down, V-cut move back out to receive the ball for the shot or drive. To execute this, O2 walks the defender down to the block, and then makes the sharp, quick V-cut back out to receive the pass for either a two or three-point shot. Diagram C. After making a couple of outside shots off option #2 above, the defender will be looking to deny the pass on the V-cut. So this time O2 does the same jam-down, V-cut as described in option 2. But this time, O2 signals the point guard that he/she is going "back-door" (use a hand signal), and makes the quick back-door cut after the V-cut. On any of these options, if the defenders on O4 or O5 come over to help on O2, then dish the pass off to O4 or O5 going to the hoop. Also, O4 and O5 should be looking for the weak-side rebound when O2 shoots.